So I am fairly certain I have probably mentioned Grease Lightning before but I need to again because it is seriously such a blessing to my face. Every time I feel a face demon trying to break through the surface of my skin I put a drop of this on top and 9/10 times it is already gone by morning! Occasionally I even just slather a layer on my face and go to bed with it on to give my skin a little pep. It does say that you can apply this over oily areas of your face to make them matte but I've never had it help me like that. You can purchase this at Lush for $19.45 and you get 45g of product! This lasts an extremely long time especially if you're using it just for spot treatment. 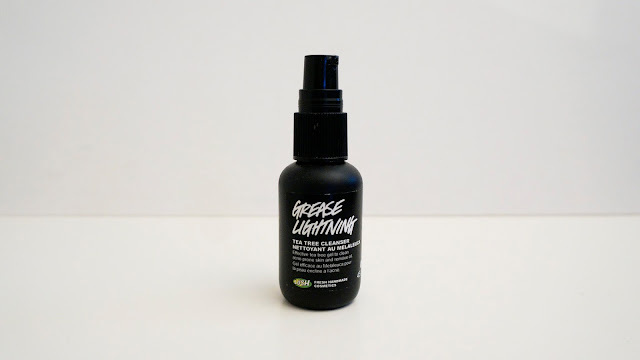 Grease Lighting is said to cleanse and soften upset skin with gentle herbal infusion of thyme, tea tree and rosemary. It's a super effective spot cleansing gel with a calming blend of organic aloe vera gel and grape juice which soothes and calms irritated skin. Has Grease Lighting been an absolute blessing to your skin? Or do you prefer a different product? Let me know! As a warning PLEASE don't let your pets get ahold of this product as it is extremely poisonous to them and can result in death!